Describe this Piece: I began this painting with watercolor on wet paper, then I collaged on hand painted tissue and rice papers. 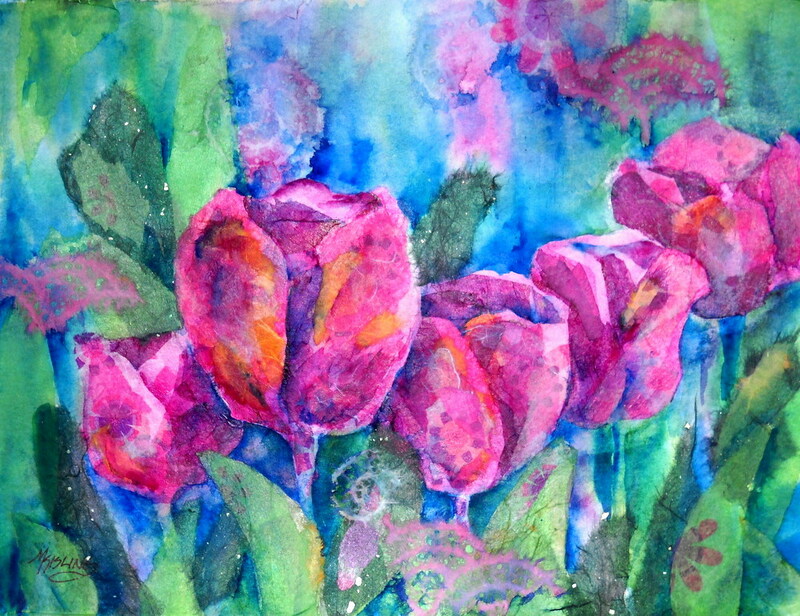 I then returned to the watercolor and used negative painting to define some of the tulips and leaves, added more collage, painted some more, more papers and so forth until I felt that the painting was finished. I have found that combining watercolor and collage can get your creative juices flowing and give a fresh new look to your paintings. What a wonderfull work you’ve done !!! I think it is beautiful,the colours are great and the whole painting is really inspiring to me.Congratulations,and thank you for letting us admire your talent. Lovely light and textures. It really works.